What's the mod way of securing your Apache-driven Web site? 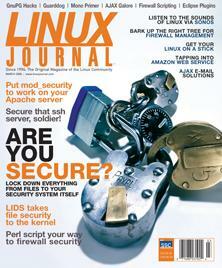 What can GnuPG do for you besides encrypt and decrypt e-mail? Don't wait until you have to exorcise a dæmon seeking to possess your SSH server. A Perl alternative to those tired of tweaking firewall rules by hand. Put a LID on unwanted file access the kernel way. Wrap up your single sign-on system with CUPS, SSH and firewall rules. Ajax expert Ben Galbraith chats about Asynchronous Java and XML. If you're itching to try Mono here's where to start. A sneaky way to get to your personal e-mail server from work. Never lose track of your constantly changing personal information again. Don't let your development habits be eclipsed by missing features others haven't yet added to this extensible IDE.